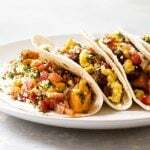 Fully-loaded breakfast tacos with a savory black bean and potato filling, soft scrambled eggs, and topped with salsa, cilantro, and cheese. This is how to do breakfast on the weekends. Sometimes I think deeply on subjects like, for example, breakfast tacos. Specifically, how breakfast tacos might have come into existence. I thought about diligently researching to find the facts on this particular subject, but instead, after gazing out the window for a good ten minutes, I arrived at the conclusion that someone with a hangover must have invented them. It really is the only thing that makes sense. Perhaps the bleary-eyed and hungover genius thought first of huevos rancheros – the classic eggs with tortillas breakfast – but opted to wrap the eggs in the tortilla along with some savory bites all in the effort of eliminating the need for a plate. Sounds about right, to me, so I didn’t see a need to dig deep into the archives of food history to confirm. 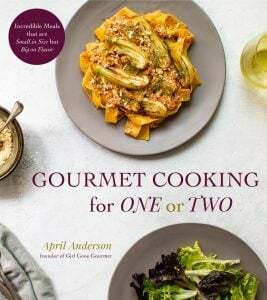 And who needs a history lesson when the question “what to make for breakfast this weekend” looms heavy on our minds? 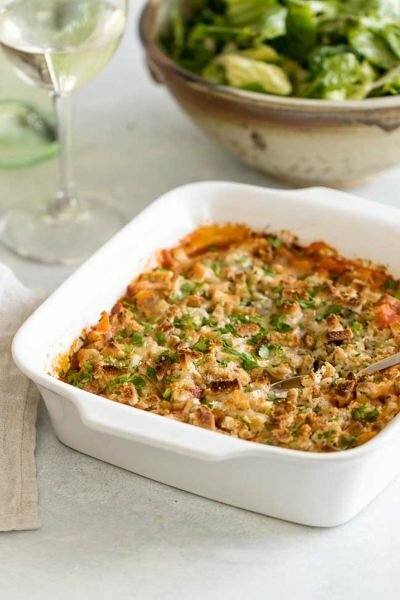 Perhaps you’re like me and already know whatever graces the weekend breakfast table it must be hearty and savory to help us meet the challenges of Saturday (or recover from too much fun on Friday night). These fully-loaded breakfast tacos check all those boxes. A potato black bean filling serves as the base for the tacos. To make things as easy as possible (because we’re talking about cooking on a Saturday morning), I suggest buying a bag of pre-diced potatoes located in the refrigerated section at the grocery store. I use a brand called Simply Potatoes. 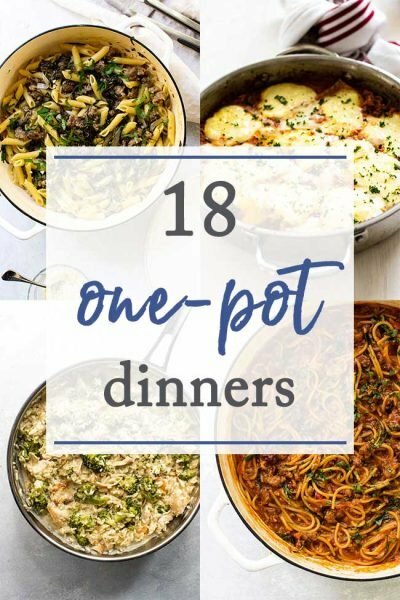 Those, along with black beans and bacon, simmer in a simple homemade enchilada sauce made with pantry ingredients. Scrambled eggs make up part two of the breakfast tacos and they are of the simple variety – just eggs, salt, and pepper cooked in a little butter. 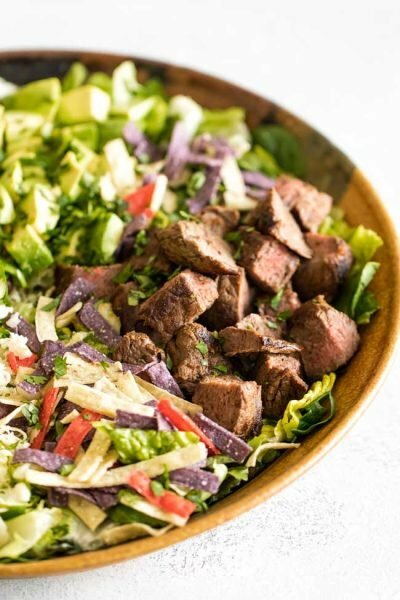 Tortillas and Toppings: I like to use flour tortillas and, after I’ve loaded it up with the eggs and potatoes, finish the tacos off with some salsa, chopped cilantro, and cojita cheese, which is a slightly salty Mexican crumbling cheese. Toppings are, of course, optional or open to re-interpretation based on your own tastes. 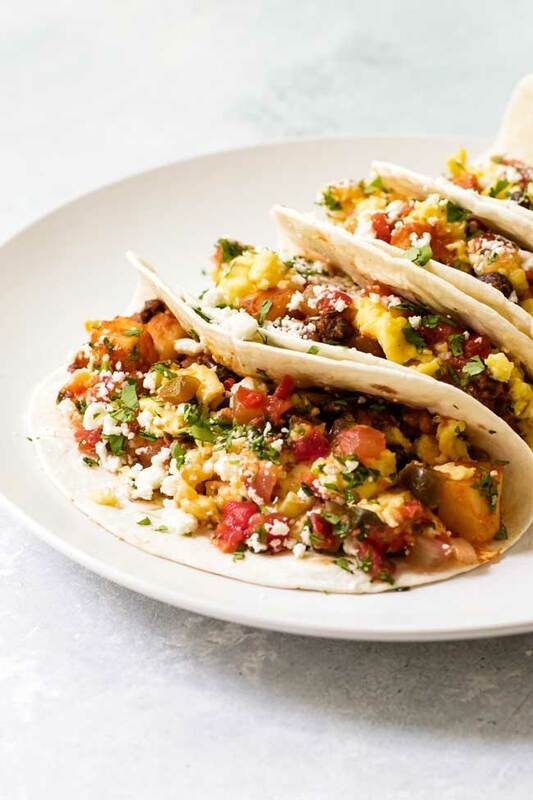 As the name suggests, these breakfast tacos are fully-loaded, somewhat messy, and do, in fact, require a plate unlike what I imagine the original intention was of the bleary-eyed breakfast taco inventor. But, if you want to try them without a plate don’t say I didn’t warn you. 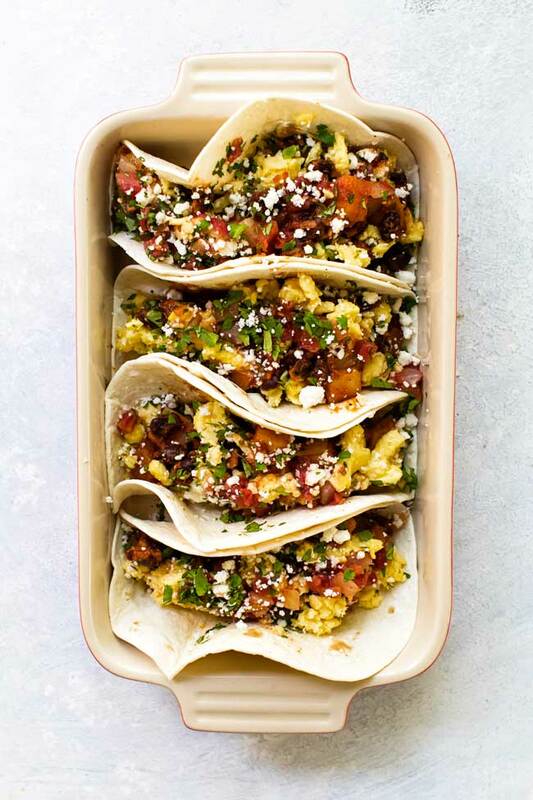 These breakfast tacos are stuffed with savory Saturday morning goodness. Savory weekend breakfast tacos with a hearty potato black bean filling, soft scrambled eggs and topped with salsa, cilantro, and cheese. They’re a little bit messy and totally satisfying. 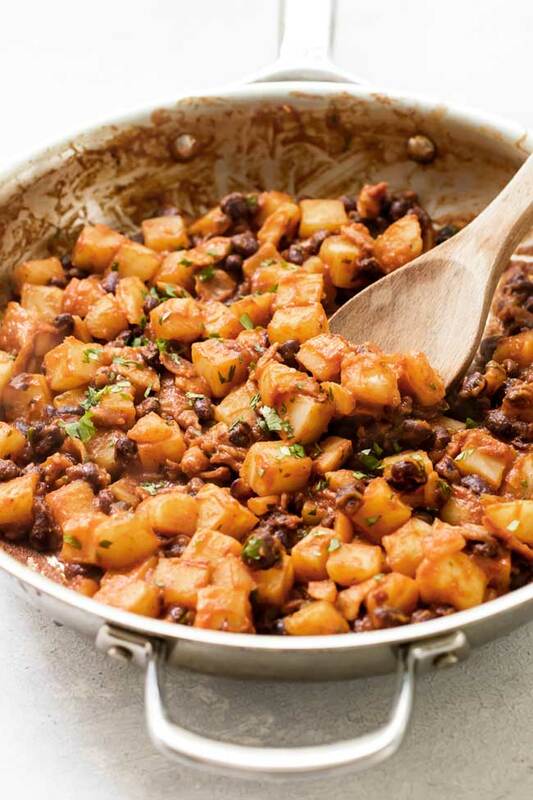 Make the black bean potatoes: In a 10-inch skillet, Cook the bacon pieces over medium heat. 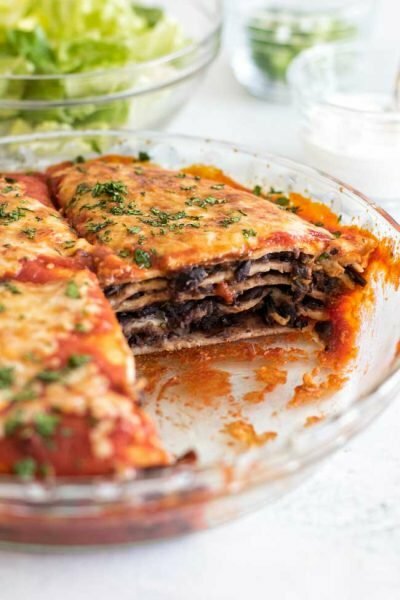 Once it starts rendering its fat, add the potatoes, black beans, tomato sauce, lime juice, chili powder, cumin, garlic powder, salt, and pepper. Stir it all together and simmer until the potatoes are cooked through, about ten minutes or so. Add the cilantro and adjust the heat to low. Cover the pan to keep it warm while you make the eggs. 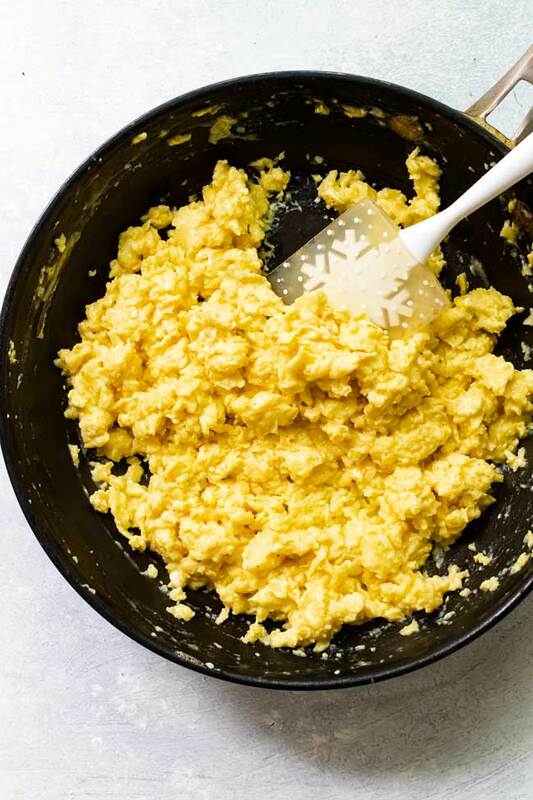 Make the eggs: In a 10-inch non-stick skillet, melt the butter over medium heat. Adjust the heat to medium-low. Add the beaten eggs, salt, and pepper to the pan. Using a spatula, stir the eggs, scraping them up off the bottom skillet as they cook. Stir until the eggs are soft and cooked through. 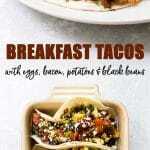 Make the tacos: Fill each tortilla with some black bean potatoes topped with the scrambled eggs. 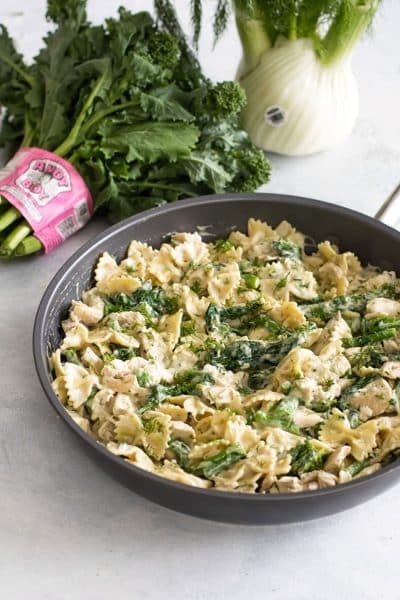 Add the toppings, if using, and serve. You can dice your own potatoes or look for bags of pre-diced potatoes in the refrigerated section at the grocery store. I use a brand called Simple Potatoes. Cojita cheese is a salty Mexican crumbling cheese that can be found in most grocery stores. If you can’t find it, crumbled feta cheese works well, too. Nutrition estimates do not include the optional toppings.